Jim Curious : A Voyage to the Heart of the Sea in 3-D Vision by Matthias Picard is, no pun intended, amazingly immersive! While I have seen a handful of 3-D kid's books over the course of my career, they have mostly been a movie tie-in or activity book and not worth my time or money. Jim Curious is a genuine picture book with a wordless narrative that takes readers on a wonderful journey. Picard's thick-lined pen and ink illustrations look almost like wood-cuts and, once the 3-D glasses are on (2 pair are included in a sturdy envelope glued into the back of the book assuring safe storage - another problem in the lesser 3-D kid's books) they almost make you feel like you are watching an old, black and white movie. 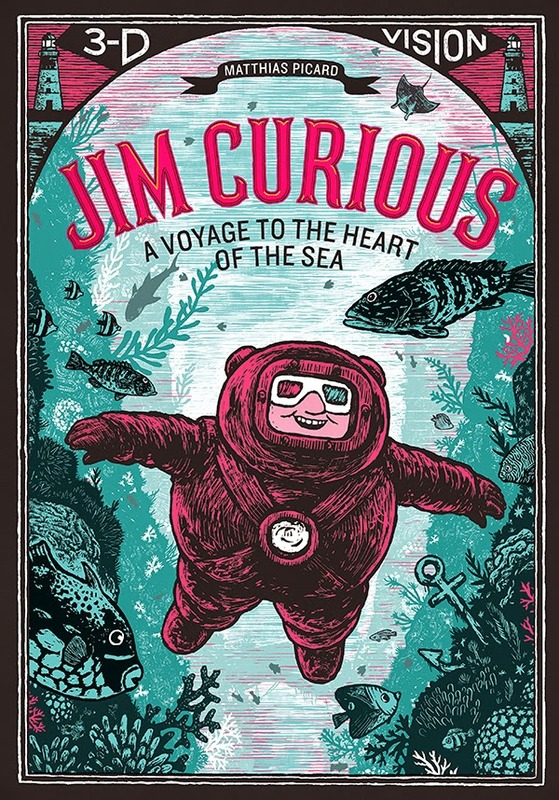 Jim Curious leaves his house in a clunky diving suit and heads to the sea. 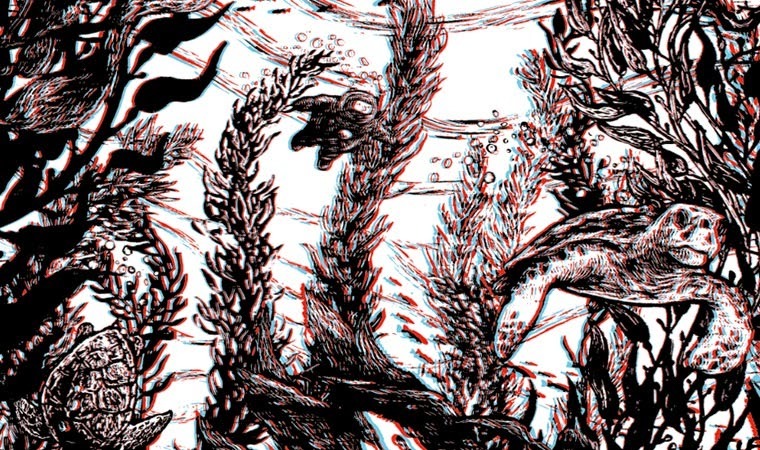 One he is submerged, the illustrations become 3-D. While Jim's adventures are clearly fantastical (there is no air supply attached to his suit) Picard forgoes a magical undersea world for a realistic one that is cluttered with human detritus, initially. Very quickly, though, Jim is gliding through kelp beds, the seaweed almost swaying as it appears through the 3-D glasses. As with 3-D movies, the illustrations in Jim Curious are thoughtfully composed to maximize the effect of the glasses. 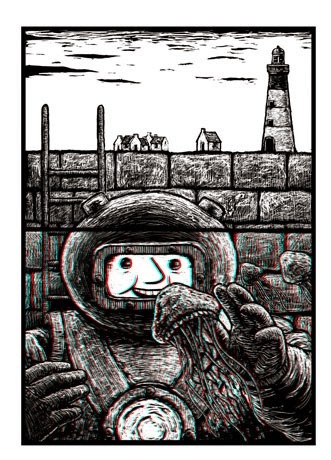 It almost seems as the illustrations are moving at time, as in the gif above. Jim makes his way deeper and deeper, into the dark depths where he encounters bioluminescent fish swirling and writhing all around him. 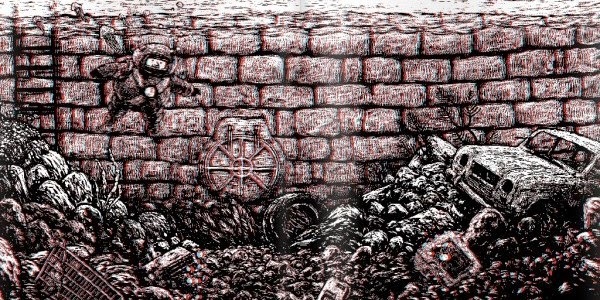 The illustrations look like the those above and below, when seen without the 3-D glasses. You can read the book without them, but it definitely is markedly better with them. 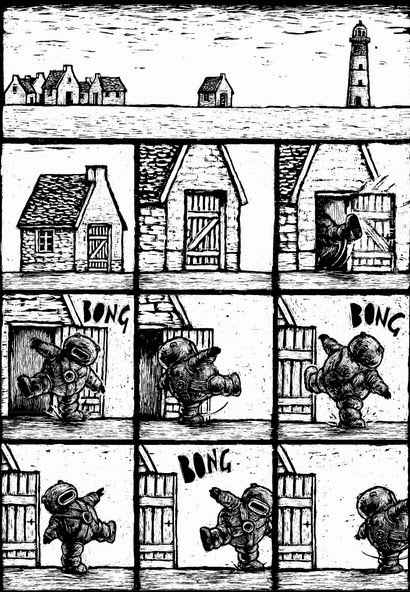 Jim makes his way to a sunken city and down a flight of stairs to an increasingly strange, abstract world where he finds a door in the floor. Opening it, the entire sea drains out in a massive whirl pool. Finding himself in a barren, dry world, Jim follows the whirlpool and jumps through the door in the floor. The final 4 pages are a gatefold spread that opens to a wonderful surprise!